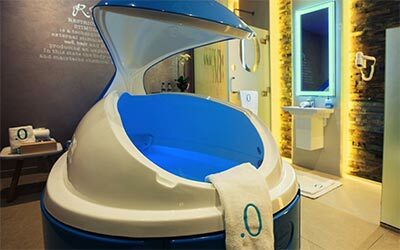 Floatation Therapy was brought to UAE as an antidote for the stressful and sometimes exhaustive lifestyle we lead. The foresight has proven successful as floatation and is supportive therapies are becoming known as a true meaning of self understanding and well-being. Floating means to float on the surface of a super-saturated salt solution. Thanks to the high concentration of salt in the water the human body “floats” effortlessly on the surface of the water without having to use any special breathing techniques or contracting of the muscles. A sensation of weightlessness is felt and as the body further relaxes, it enables a deep sense of contentment. In absolute peace and quiet, the nervous system and brain are no longer stimulated by external senses. This reduction of stimuli also enables physiological relaxation thanks to inner mental peace. Floating Pools come in various sizes and shapes and are filled with salt-water solution to enable the medium of floating; imagine or remember the sensation of floating in the Dead Sea, Jordan. To enable true REST (Restrictive Environmental Stimulation Therapy) the pools are covered and floating is restricted to one or two persons. The temperature of the water is between 34.8 to 35.2 skin temperature. At Point Zero our pools are called Cabins or Pods. German designed and installed luxurious cabins are spacious with light therapy and individual controls for lights and music. Recommended for first timers who are nervous of confined spaces. Can accommodate two floaters (same gender). British designed and installed pods offer a more intense experience due to the smaller cabin area. Color therapy, star effects and individual light and music control can be requested. Accommodates one floater. We havea range of meditative music for you to choose from. If you prefer to have your own music please bring it on an Apple device and we will play it for you. We offer 30, 45, 60, 90 minute floatation sessions plus a further 30 minutes for pre and post showering. Arrive 10 minutes early for your first orientation. We provide body wash, shampoo and conditioner, comb, hairdryer, slippers/flip flops, towels, make up remover, earplugs, shower caps and disposable underwear for your convenience. Grab some room temperature water first. Still bottled and defused water is available in order to keep you hydrated. Use the bathroom before your session to avoid interruptions while you relax. Avoid caffeine for a few hours before your session. It can prevent you getting into the meditation zone. Eat a light meal a few hours before, floating after a banquet or on a full stomach isn't a good idea. Avoid shaving a few hours before. You can use Vaseline to cover up cuts and scratches but best not to enter the salty water with freshly shaved or burned/sun burned skin. Leave yourself some calendar time to enjoy the experience, head to our chill-out room and enjoy a fresh cup of herbal tea afterwards, let it sink in. Always use the lavatory before entering cabin or pod; shower before and after your float; use cleaned and sanitized flip-flops provided; use the ear plugs they keep the water and salt out of the ears and offer deeper silence; close cabin door after finishing; consider staff and clients and keep to the maximum 30 minutes available to dress after floating. With thanks. Chat to our doctor for clarification if you are unsure whether to float. Plus some considerations: post pregnancy, menstrual cycle, ear infection, sensitive areas, large cuts or wounds, virus or physical illness, clinical depression, paranoia and epilepsy.